Today, I am writing from a lovely condo in the mountains of Colorado. A glorious place indeed to welcome the first days of the fall season. I have enjoyed blue skies, sunshine, moderate temperatures, and refreshing breezes as I hike along the countless trails in the mountains. The aspen trees are splendid—dressed in gold and orange leaves. But I know this is a passing moment in time. Winter will come. The leaves will fade from the vibrant colors of today to the brown colors of winter. The circle of life continues to spin as time marches on. So in this moment, I am savoring every sight, sound, and smell. Yesterday, nature provided a little preview of the winter season that awaits in the wings. I arose to a beautiful morning. After breakfast while contemplating plans for the day, I watched a rapidly approaching bank of clouds, rather dark and foreboding. As the clouds blew over and slid down the mountains to the west of my condo, the wind increased dramatically bringing a mix of rain and snow. It was amazing to witness how quickly the view outside my window changed. In the blink of an eye, a golden fall scene changed to a stormy winter landscape. My plans for a morning hike changed rapidly as well! The short-lived storm of yesterday morning is a wonderful metaphor for the storms of life. 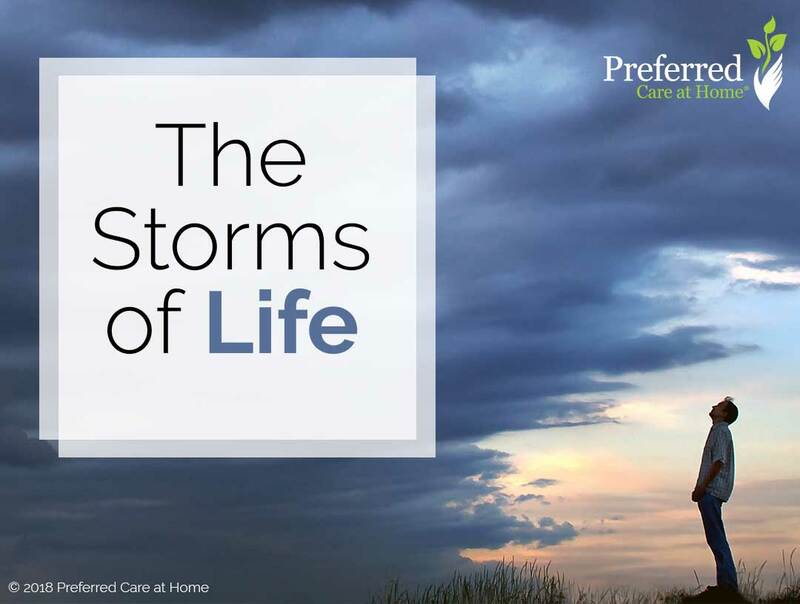 Storms of all types blow into our lives—some expected, some not. We may see a hint of the storm on the horizon as it prepares to shake up our world. We can opt to ignore the signs, to fret and worry, or prepare for the coming storm. Regardless of the response, a storm disrupts the landscape of life and often requires a change of plans. The lesson to be learned from the mountain storm yesterday is this—storms pass. Might be a matter of hours. Could be a matter of days. But by their very nature, storms pass. Then the challenge is to deal with the aftermath of the storm. Assess the damage. Make the needed repairs. Determine the long-term implications. Adapt. Adjust. Move on with life. This same scenario is playing out on the East Coast in the aftermath of the recent hurricane. So, I am blessed as always by my time in the mountains. This time, I was blessed to witness the storm that reminded me of the nature of life. Storms will come and storms will go. In the aftermath, I have the option to seek the help I need—and to offer help to others in need. In my humble opinion, this is the essence of life—to love and to serve each other. By so doing, we can weather any storm.